The Strategic Defense Initiative Organization (SDIO) and its proponents planned to conduct Demonstration/Validation tests of the ERIS technology. These tests were to demonstrate the ability of the technology to perform the required tasks, and validate a future decision whether to proceed with Full-Scale Development. 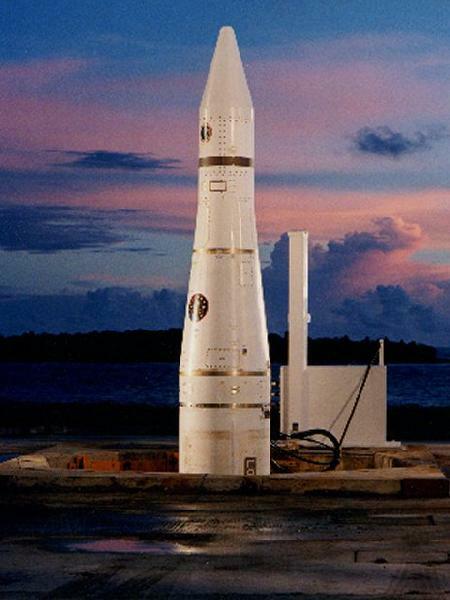 Demonstration/Validation tests would be conducted at the Arnold Engineering Development Center, National Test Facility, Nevada Test Site, Harry Diamond Laboratories, Vandenberg Air Force Base/Western Test Range, U.S. Army Kwajalein Atoll, U.S. Naval Pacific Missile Range at Barking Sands, and contractor facilities. Tests would include analyses, simulations, component/assembly tests, and flight tests. In late FY 84, BMDSCOM awarded four contracts, worth approximately $500,000 each, for the concept definition phase of the Excatmospheric Reentry vehicle Interceptor Subsystem (ERIS) to develop interceptor technology that will use external precommit sensor capabilities in a nonnuclear kill design. In 1985 the Exoatmospheric Reentry-vehicle Interceptor Subsystem (ERIS) project office opened with the mission to develop a kinetic energy kill vehicle that would intercept enemy missiles outside of the Earth's atmosphere. The ERIS was built on the technology developed and tested during the Homing Overlay Experiment. Constructed of surplus Minuteman ICBM second and third stages, the experimental ERIS missile would incorporate a kill vehicle with a long wavelength infrared scanning seeker, a data processor and flight divert attitude control propulsion motors on a two stage rocket booster. The 352 pound ERIS interceptor would receive information from external sensors and, based on this data, select the appropriate target by comparing flight signatures. The first major milestone of the ERIS functional technology verification program was met in April 1989, when the integrated system test vehicle left the manufacturer's facility to begin the test phase. There were another two years of testing before the first flight test. Nevertheless, only a decade after the HOE intercept, an ERIS launched on Jan. 28, 1991, from Meck Island and successfully detected the target. It also discriminated against decoys, and intercepted the mock ICBM warhead launched from Vandenberg Air Force Base. The test, "the first time an SDI experiment attempted an interception in a counter-measures environment," exceeded expectations for this initial mission. 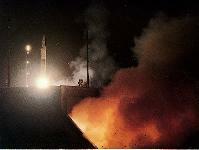 The second and final test, due to budget cuts, was conducted on May 13, 1992, against a Minuteman I ICBM. The primary focus of this effort was on data collection, guidance, acquisition, and track and divert functions. Although a direct intercept was not achieved, the mission met its objective demonstrating target handover, acquisition and resolution of threat and the collection of radiometric data on the target and decoys. Overall, the ERIS program was considered successful and achieved its objective of demonstrating an ability to intercept strategic ballistic missile targets with non-nuclear interceptors. However, during such technology demonstrations, while programs strive to meet our test objectives of successful intercepts, it is important to realize that early tests learn much from failures. Detailed analysis of telemetry data and test results showed how to improve technology, system integration and test operations. The technology developed as part of the ERIS program and the lessons learned during its testing were essential for the successful development and deployment of the next generation of exoatmospheric kill vehicle which is part of the Ground-based Midcourse Defense (GMD) system as deployed at Fort Greely, Alaska.